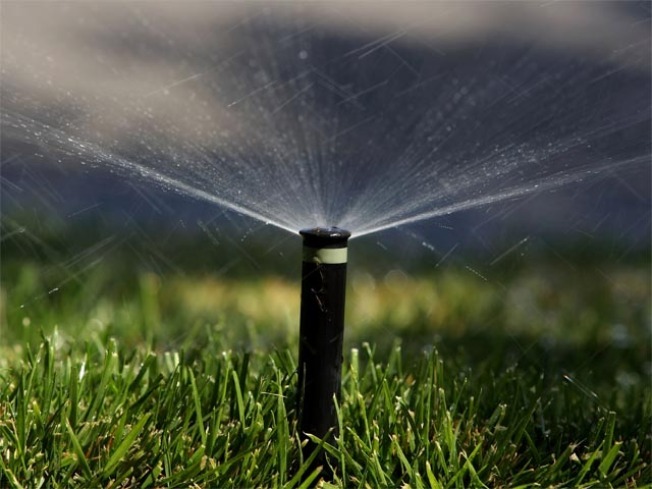 Aquarion Water Co. is asking customers to hold off on the lawn watering for now. So you want to beat the heat with a run through the sprinkler? That may not be so easy in some Connecticut towns. The heat wave has strained the water supply in part of the state and Gov. M. Jodi Rell is urging residents to limit their water usage and use caution because of fire danger. East Lyme issued mandatory water conservation on July 2 and water restictions from 9 a.m. on Friday to noon on Monday until further notice. The town is prohibiting sprinkling, watering or irrigation of lawns and washing of motor vehicles, outdoor surfaces of all buildings and structures, sidewalks and driveways. Residents are not allowed to fill or cleaning swimming and wading pools and public restaurants are prohibited from serving water to customers except when they specifically request it. Violating the restrictions could bring a $99 fine. Parts of Fairfield County are also having water problems. In fact, Aquarion Water Co. said on Tuesday it had the highest single day of water usage demand in its history. That impacted water pressure for customers in several towns. Because of that, Aquarion has asked customers in Westport, Greenwich, Darien and New Canaan to voluntarily restrict their use of water for one week. They're asking people to not water lawns, wash cars or fill pools during that time. Officials from the Cromwell fire district are also asking residents to conserve water, the Middletown Press reports. In Manchester, water conservation is voluntary but water department officials ask residents not to water lawns or do non-essential watering during the heat wave, the Hartford Courant reports. Putnam officials have also ordered a ban on nonessential water use, the Norwich Bulletin reports. Wilton officials are also asking residents to not water their grass or gardens and conserve water, the Wilton Patch reports. It's not just the heat that is the problem, Connecticut hasn't had measurable rain in two weeks. Rell has asked for updates from state agencies with responsibilities for water quality and supply as well as agriculture, public safety and other issues. The state’s standing committee with responsibility for long-term management of drought-related issues will meet on Monday. The state offers water conservation tips, including refraining from pouring water down the drain when it could be used to water plants or gardens. You can find more water conservation tips here.